Around the age of 8 to 10 weeks, a pit bull puppy should begin a serious potty-training regimen. Potty training a pit bull can be frustrating, tedious and time-consuming, but it's a necessary step in training your puppy. A pit bull owner may believe something is wrong with the puppy if it has an accident indoors. But most potty-training problems stem from mistakes the owner makes. Find a spot outside your house (preferably in your back yard) where your pit bull puppy can relieve himself. Place the puppy in the designated area and allow him to become familiar with it. Confine your pit bull puppy to a small area within your home. A good place to confine him is near his sleeping area, because he will be less apt to relieve himself there. The point of doing this is to encourage him to hold back his urge to urinate or defecate. This will teach him control over these urges. When your puppy expresses the need to urinate (excessive sniffing on the ground is a telltale sign), immediately take him outside and place him in the designated area. The younger the puppy is, the less amount of time he'll be able to hold his urine, so make sure you check on him frequently and watch for signs that he needs to go. Reward your pit bull puppy with a treat and praise. Pet him, play with him and show him attention so he associates his behavior with a positive experience and will be more likely to repeat the action. 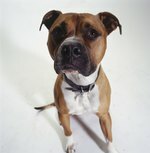 Install a doggy door that leads to the area where your puppy has been trained to relieve himself. This is not necessary in potty training him, but he will be less likely to have an accident inside the house if he can go outside on his own. If your pit bull puppy relieves himself inside the house, it is not necessary to punish him. Hitting the puppy or shoving his nose in his urine is not an effective way to change his behavior. Attempt to correct his behavior only if you find him in the act of urinating or defecting inside. Tell him "no" in a clear, strong voice and take him outside. Clean and deodorize any urine or feces inside the house as soon as possible. If you do not remove your puppy's waste, he will continue to use the spot to relieve himself. Continue to praise your pit bull puppy's good behavior and correct the bad until he no longer has accidents inside the house.